What Thule did is take a tray from their bike rack system, put it inside a hardshell case, and include tripod legs so it’s a stand. The bike is secured on the tray with a fork mount, just like the roof rack, and you remove it from the Transition with a quick release and drop it onto the stand. As I said in this video, I’ve dragged many cases across airports and the transition is by far the sexiest, rolls the best, and it’s meant for the good bike with two sets of wheels: training and racing. Unless you use Jedi Mind tricks at the ticket counter, you’re paying to fly with this case: it’s huge and, as packed, weighed about 75 pounds. Beside the wheels and bikes, inside are Lezyne tools, a pump, shoes, helmet, and kit. Traveling with bikes will cost you one way or another, amortize an S&S case over a hundred trips, toss a folder into a case for urban riding and nothing too long, or bring the race bike and fast wheels. See my post in the archives about the various ways to travel with a bike. A few first generation complaints include fussy straps that a TSA agent didn’t reconnect properly, padding between the half shells that delaminated, and the fork mount cylinder doesn’t latch in place (the system accommodates all fork leg types, so it’s modular). In hotels or vacation rental condos, you don’t want anything to fall out of anything else; especially, when jet lagged and in a hurry to ride. Thule impresses us with their products and the Transition is a brilliant combination of what cyclists need to travel. Keep that big, black, box out of the sun though, it could double as a solar distill. 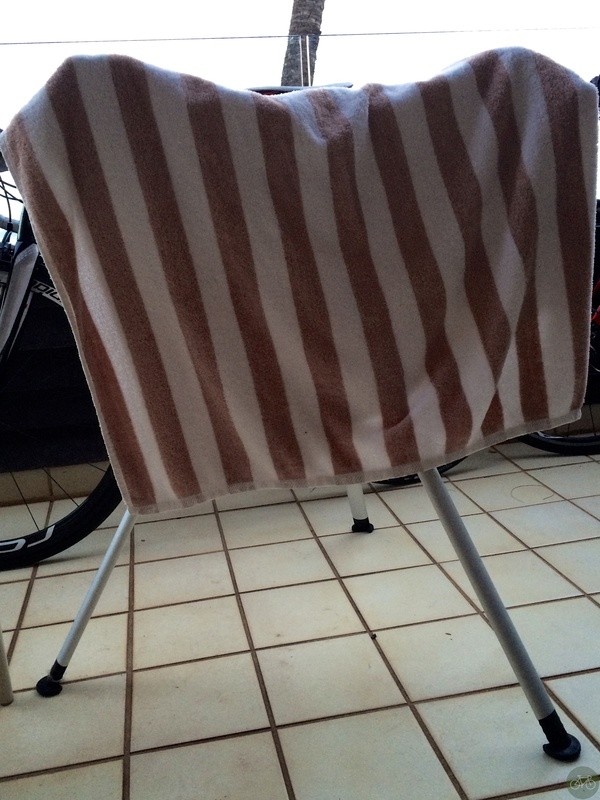 The bike stand inevitably turned into a towel drying rack after a day when I snorkeled, rode across a lava field, and body surfed. Thanks Thule. You are very versatile.